Astrokid248 is not only a world class dare devil when it comes guzzling hot sauce, but she also possesses creativiTAY. Case in point: my Secret Santa gift. 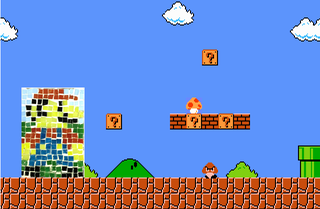 It's a handmade, 8-bit Mario coaster (I've embedded in World 1-1). Like many great works of creativiTAY, it has a harrowing back story. Originally I was gonna whip up a batch of triforce ornaments for as many people as I could, and make a triforce coaster to go along with it for yours, but when I went to get the grout I found a kit that had the grout, a coaster base and a bunch of glass "squares" in it. From the color of the squared I changed my plan to doing a Mario 8-bit coaster, and a triforce ornament, but had to abandon the ornaments due to a lack of time. So I got all the pieces cut, 9 from each piece of glass, expect the glass pieces weren't ever square in the first place, so the cut pieces weren't quarter inch squares like I wanted. I decided to try grinding them all to shape, but to get it there by that Saturday, I needed to ship on Thursday, and I didn't have time to grind all the pieces. So I grabbed a random sheet of Lexan, glued the chips to that instead, and overnighted it on Thursday between my finals. I was really unhappy with how shoddy the work was but I didn't want to leave you hanging with no present. Balancing a Secret Santa project and finals has gotta be stressful. But, shoddy? It looks pretty rad to me. What do you guys think?